Before winding around the mountain to Crested Butte, CO, we dropped Chloe off at the airport in Denver. We gave our hugs, said our goodbyes, and pulled around the parking lot to rest Julius and see her off. Our first turn around a corner sent a leftover cheeseburger and Shane’s laptop flying off the cooler in the backseat -- something Chloe had prevented while she rode backseat. With a computer and condiments hitting the deck, it was apparent: we missed Chloe before she was even in the air. Project Wildness limped on with one fewer to Silverthorne, CO, where we were to meet a group of high school friends at a mountain cabin for the weekend. Hot tubbing, hiking, and hanging out were in store and all had a great time. True to the last couple of weeks, we had to press on to Crested Butte and spent our first night listening to an open mic and buying drinks for the entire bar! Check out our last post for all of the details! That night we camped just outside of town with another Shane who travels the West in a VW van selling outdoor gear for Wilcor Outdoors. Crested Butte was incredibly kind to us and the owner of Pitas In Paradise invited us back for lunch the following morning -- on the house! As we sat eating their incredible food, we talked about the work kitchen staff does with little to no recognition. Anyone who has worked behind those closed doors knows that when a cook makes a mistake the blame lands almost entirely on him/her. When he/she puts out a perfect dish, very few people take the time or energy to search for the cook and show their appreciation. On this day, we couldn’t help but notice many of those working in the kitchen were young guys starting their first jobs while the older guys showed them the ropes. We talked to Shannon, the owner of the business, and she informed us she had seven cooks and bus boys in the back working their tails off. She didn’t hold back her appreciation for such an excellent group of guys and couldn’t have found a negative word to say about them if she tried. We asked Shannon to round them up so we could show them just a little more appreciation than they might see on a regular work day. Within minutes, out came the guys: Xander, Sam, Zach, JP, Cody, Story, and Finn. All looked a bit confused at first, but we handed them each a $20 bill and expressed our thanks for the work they do each day. All of them lit up and asked about Project Wildness. Once again, the crazy connections to people and places poured out. A couple of the guys had spent lots of time in Grand Forks where Shane lived before this trip. One of the servers knew a great college friend of Nate’s and our travel companion, Shane, knew a good friend Nate had met traveling in Central America -- just another lesson that opening doors to conversation can link people in an instant! We found out later that Finn, a local high schooler, was working his first day at the restaurant and would be able to take home his $20 and a great story to his family and friends! In fact, as Shane walked past the kitchen he overheard the guys in the kitchen talking about their own ideas of paying it forward and future travel! How incredible it is to see how such small acts can blossom into so many more positive ideas and actions! To Darla and Hodge… Your hard work does not go unnoticed. You work for the community as a whole and its children who so deserve to have people like the two of you in their lives. You go out of your way to show incredible appreciation to those who help your businesses succeed. You embody the mission we set out to fulfill when we started this project and know you’ll continue serving others in so many beautiful ways. Continue being you. We and the rest of the community appreciate you and all you do. 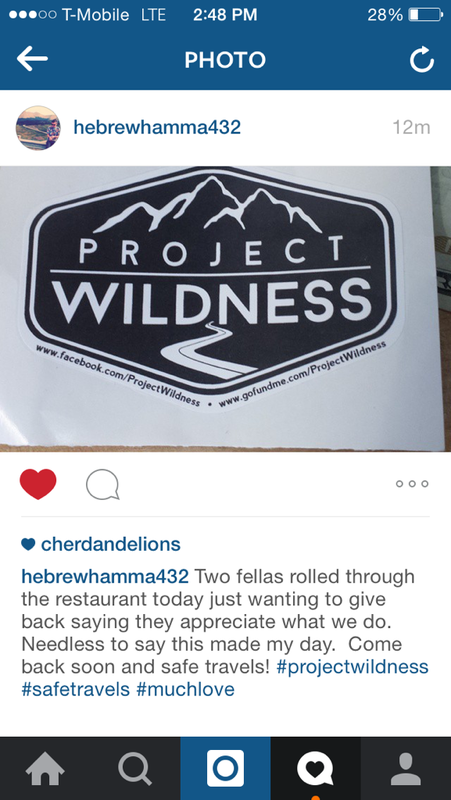 To Morgan from Pinky’s Cafe in Livingston, MT… You gave with the request to recognize a cook somewhere down the line. 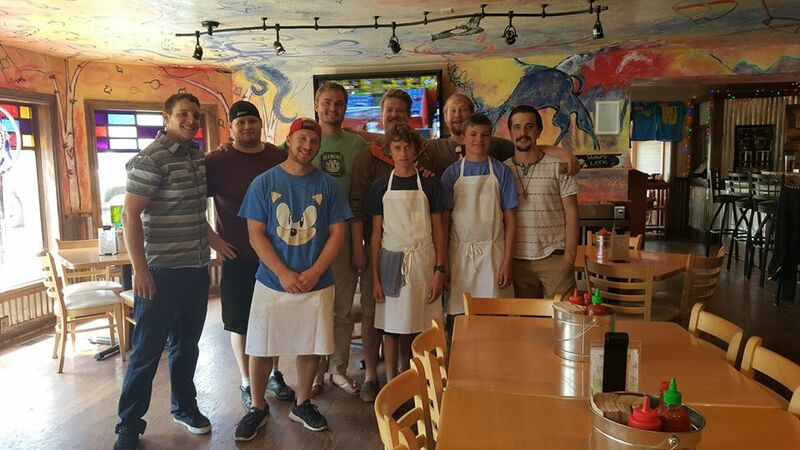 Today your donation helped recognize seven young men in Colorado and the hard work they do to keep a business running. You’ve likely witnessed firsthand the blame and often lack of recognition for people in your profession and today you were able to pass on some much deserved appreciation to future owners of places like Pinky’s Cafe. To Robin J… You’ve followed our journey from its beginnings and gave trusting your money would help someone. You do good for people each day for your family, friends, and the children you work so hard to serve. What you gave has helped a group of young men realize that doing good doesn’t have to be difficult -- something you show with ease.